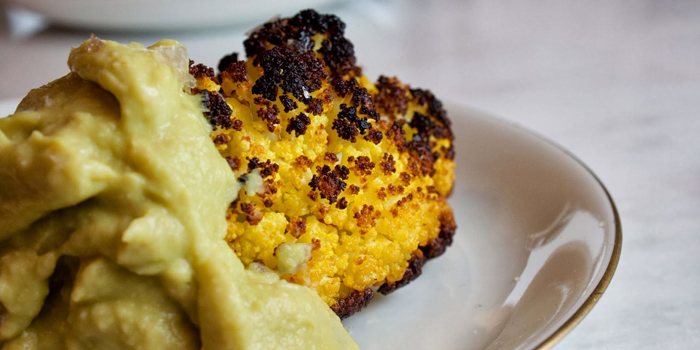 Poached in a spicy, lemony broth, then roasted till crispy on the edges, kissed with salt and then dredged through a luscious avocado hummus—it is to die for. The original recipe came from Epicurious, but it didn’t work for me. I needed to remove all the dairy and wine (damn detox), which comprised a lot of the ingredients. But this gave me the perfect opportunity to recreate this recipe into one that is simply divine and healthy! Dave isn’t a cauliflower fan, but he gave this two thumbs up. He actually thought there was cheese in it because it was so rich and fulfilling. We ate the entire head of cauliflower standing at the counter, with the photo lights still on. Cauliflower is rich in nutrients (vitamins B’s & C, fiber and folic acid) and, even though I don’t believe in calorie counting, this in low in them. The olive oil and avocado fill you up with good fat and the chickpeas sneak in protein. Clean the cauliflower. Bring to boil: broth, olive oil, lemon juice, pepper flakes, salt, turmeric and the garlic clove. Add the cauliflower, reduce to a simmer and let cook for 15- 20 minutes, rotating a few times during cooking, until knife tender. I would caution not to overcook this at this point. If you like a more tender cauliflower you can go a little longer, but you will lose some of the texture in the stem area. Preheat the oven to 475 degrees while the cauliflower is cooking. Use a slotted spoon to bring the cauliflower out of the broth, shake a time or two and set it on your pan. I used a ceramic pie pan. Set the broth aside. 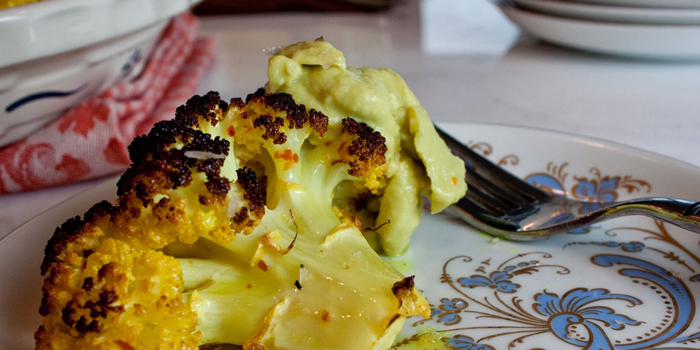 Place the poached cauliflower in the oven for about 20-40 minutes, until it is roasted all over. Rotate the pan at least once while in the oven. 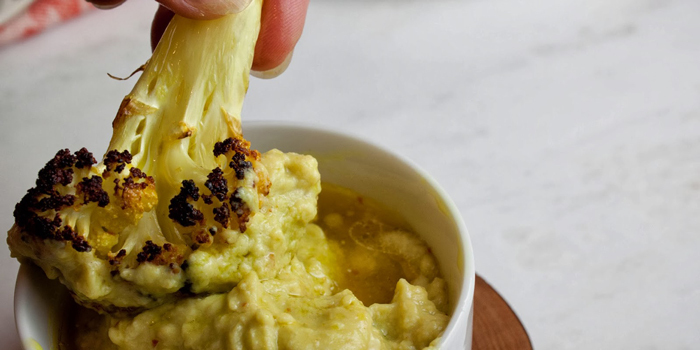 Make the Whipped Avocado Hummus while the cauliflower is roasting (recipe below). Remove the cauliflower from the oven, sprinkle with coarse sea salt. Add an optional final drizzle of olive oil. Serve immediately with the whipped avocado. In a blender or food processor, blend the chickpeas and the garlic clove until smooth. Slowly add the broth as needed to reach a smooth consistency. Add the avocado and a squeeze of lemon and process until smooth. Place the hummus in bowl and add a little drizzle of the broth to top it off. 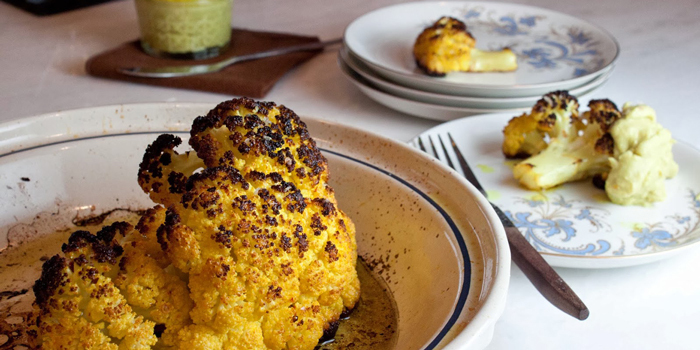 Serve with the roasted cauliflower. Fat and Happy Food Blog Tips and Techniques: A full teaspoon of the red pepper flakes really gives the broth some kick. If you are leary of spice, cut the pepper way back. You will use some of the broth in the hummus. Save the rest for future culinary projects.